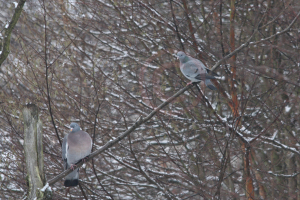 Observation - Stock Dove and Wood Pigeon - UK and Ireland. Description: A photo showing the difference between two pigeon/dove species. I think Stock Dove is a really pretty species. A photo showing the difference between two pigeon/dove species. I think Stock Dove is a really pretty species.